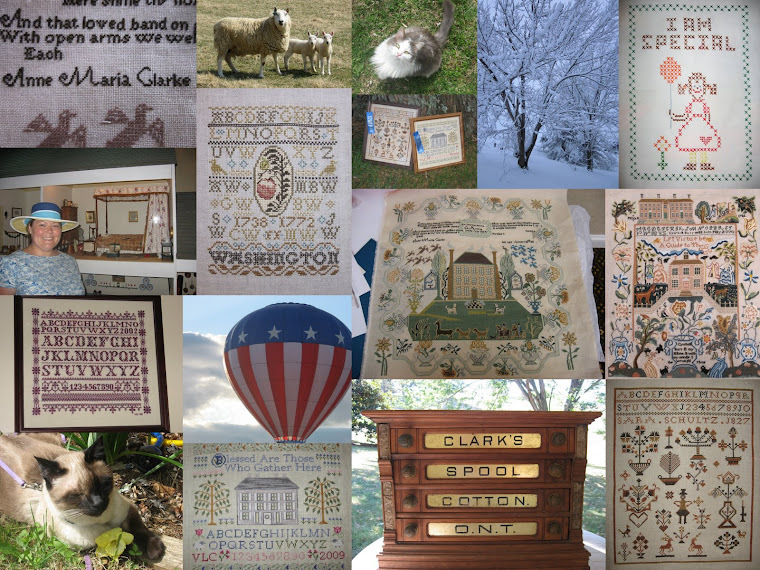 A Shenandoah Sampler: A 2010 Finish! I put the last stitches in "Blessed Be..." this evening. I have enjoyed stitching this sampler, but I can honestly say that I am *thrilled* to be finished with it! It has been a long time coming too! I have been working on the piece since January of 2008 and it is a wedding present for my hubby (eventhough we were married in July 2008!) I was on the way to finishing in October until I uncovered a horrible mistake. Somehow, the house was not centered and I ended up ripping out half of the sampler so that it would be correct and not look odd. It is dated 2009 and I am leaving it since most of it was stitched in 2009. I am so excited to move on to something new! I had forgotten how great it feels to finish a project...glad that I could share it! Happy Stitching! I hate it when that happens! I have done it too! The final result is beautiful though! Fantastic job. I have this in my to do pile it has been there for almost two years. After seeing yours I think I should get started on it.